Truly bizarre bug that I have verified &dash; basically your QBO API request URL doesn't matter. I fixed this on qbo_api but be aware of this fact if you are on qr-ruby or for your internal error handling code. Now why would I need to fix a XML error response for a JSON-only library? 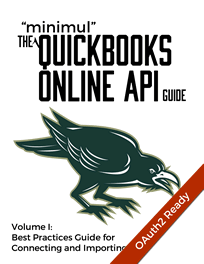 Because sometimes that's what the QBO API wants to do &dash; by golly. Great thread started by Jared Moody &dash; the more info revealed on this topic the better off we all are. Not that any of you are using that awful thing but I thought you might be glad to hear it is offically dead. This goes into effect at months end. As Ruby devs there shouldn't be anything to do but don't be suprised if you get a support ticket from a user still on IE 10 trying to authenticate. 10 Reasons Why You Should Enter the #SmallBiz #AppShowdown! Intuit's attempt at humor needs work like other aspects of their business but $100K in prize money is nice plus getting on the App Store is great for marketing. Another resource's FullyQualifiedName is filterable, in this case Item &dash; somewhere Keith Palmer is happy. Why is Intuit requiring Flash on their dev site? Adobe doesn't even do this. If you haven't yet started your integration project this book is a must read, saving you a boat-load of time. Special offer: $15 off &dash; click on the image below which is the discounted link to the book.